Sony has a history of proving their abilities to make highly functional and appealing piece of technology over the last few years. From the company’s camera series that’s being popularised among photographers to their luxurious LCD HD televisions that are known to be live with the colours of the screen. The Sony XBR-65X900F is one of the newest additions to their smart TV collection – and its already impressing thousands due to its featuring of the brightest LCD screen seen yet with a Sony television. Priced at $2,199.99 for the luxurious 65-inch television – it in on the more expensive side of things. Though the lacklustre black levels and the occasionally slow interface, this television has marked down points for this television. The XBR-65X900F is another addition to Sony’s minimalistic aesthetic for their televisions. The screen is outlined with a thin, black metallic bezel with sharp angular corners that should be considered when finding a sport for your television. The TV features a sleek chrome accent aligned against the bottom bezel – which is lovely as it never catches the annoying glare that can ruin your viewing experience. The TV also stands on two grey metallic legs that perfectly match the accent, which will allow for the television to have support as long as it is placed on a stable and flat surface. The power cable is attached to rear facing port, which will allow it to be hidden easily and avoid it becoming an issue for children and pets alike. All of the other ports are featured on the left side of the television. One being an HDMI port, two USB ports, and four 3.5mm connectors for multiple headphones/external audio and composite/component video in. The other ports hold an additional three more HDMI ports along with an area dedicated for antenna/cable connections. The remote that is included with the television is the typical thick and button-filled wand that has been seen with other Sony televisions. Its black, clunky, with a circular direction pad that is midsized. It featured a number pad over it along with the typical buttons for playback, volume, and channel selection below. An interesting addition is the Google Assistant feature on the remote, along with the microphone that aids in the usage for voice assistance on the television. On the interface, it allows for users to have an easy directional page dedicated to external viewing options, such as Netflix, YouTube, and Google Play. Although clunky – the remote does feature an array of buttons and features that makes the television easier and smoother to use. While the overall design of the Sony XBR-65X900F is extremely well-made, functional, and easy to use, there are small issues such as the occasional lagging of the user interface, usage with high-speed internet, and the slight picture quality degrades when the television is strung up against the wall. Plus, the price of the television seems a high especially considering it’s nothing that is overly spectacular interns of design and appearance. However, the excellent motion handling, bright HDR highlight, amazing picture quality, and the modern remote does make this television a unique. 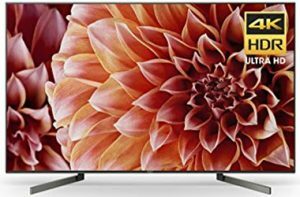 The Sony XBR-65X900F is perfect for any lovers of Sony that do not mind spending a pretty penny for an array of features that make watching television even more enjoyable.